SEATTLE – Hours before he would step to the mound of T-Mobile Park for the first time as a member of the Mariners, Anthony Swarzak discussed his growth as a reliever, recalling time spent with the Yankees when they had the three-headed monster of Dellin Betances, Andrew Miller and Aroldis Chapman. His biggest takeaway was pitch to your strengths instead of pitching a batter’s weakness. Well, he got to show that with the game on the line. Called on to protect a one-run lead and Marco Gonzales’ gem, Swarzak entered the game in the top of the ninth inning Tuesday with one out and runners on the corners. He calmly struck out Albert Pujols and got Jonathan Lucroy to ground out to end the game for a 2-1 victory over the Los Angeles Angels. A save in his first appearance. Gonzales was brilliant, pitching 8 1/3 innings, allowing one run on four hits with a walk and three strikeouts to improve to 3-0. Daniel Vogelbach made sure Gonzales was in line for the win. With Edwin Encarnacion scratched from the starting lineup a few hours before game as a precaution for a sore hand/wrist, Vogelbach got his second start of the season. He provided two of the Mariners’ five hits in the game – his first hits of the season. But the second one was the biggest. Vogelbach broke a 1-1 tie in the eighth inning, sending a line drive over the wall in deep left-center, landing into the area known as The ’Pen. Gonzales jogged to the mound to start the ninth with a sizable portion of the 13,567 in attendance rising to acknowledge the moment. His ovation was even louder when he exited the game two outs sooner than he wanted. After retiring Zack Cozart to start the ninth, Gonzales walked Mike Trout on four pitches. After falling behind 2-0, there was no way Gonzales was going to groove anything to the Mariners’ main hitting nemesis. Andrelton Simmons ended Gonzales night with a single just past a diving Tim Beckham at shortstop, allowing Trout to race first to third. Manager Scott Servais went to his bullpen, calling on Swarzak to get the Mariners out of the jam. The Angels manufactured their lone run off of Gonzales in the second. Lucroy led off with a double over the head of Mallex Smith in center. He advanced to third on Kole Calhoun’s ground ball to second and scored on Kevan Smith’s ground ball to shortstop. Following the Lucroy hit, Gonzales retired the next 17 hitters. Lucroy broke the run of consecutive outs with two outs in the seventh, singling up the middle. But Gonzales got Calhoun to hit a weak ground ball to first base to end the inning. He’d thrown 76 pitches to get through seven innings. After struggling to solve the riddle that was the assortment of sinkers and curveballs from Angels starter Trevor Cahill, the Mariners finally got to him in the bottom of the sixth. Over the first five innings, Cahill had allowed one hit – a third-inning double to Vogelbach. Dee Gordon tallied Seattle’s second hit of the game, pulling a ground ball just inside the first-base bag for a one-out double to start the rally in the sixth. Gordon advanced to third on a wild pitch and trotted home when Mitch Haniger smacked a double into the left-field corner. 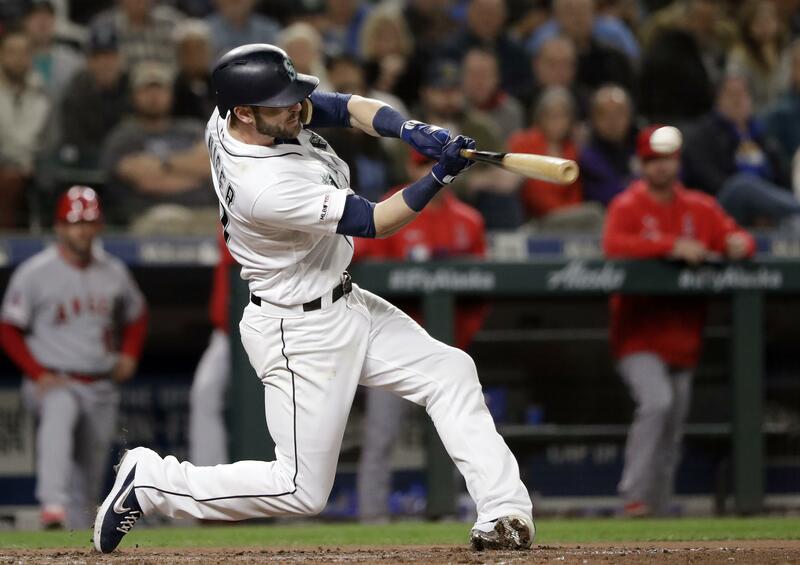 After a few ugly swings in all three of his plate appearances, the Haniger wouldn’t give in. He refused to chase a 3-2 changeup in the dirt. When Cahill came back again with a changeup on the next pitch, Haniger was ready for it. Published: April 2, 2019, 10:08 p.m. Updated: April 2, 2019, 10:28 p.m.